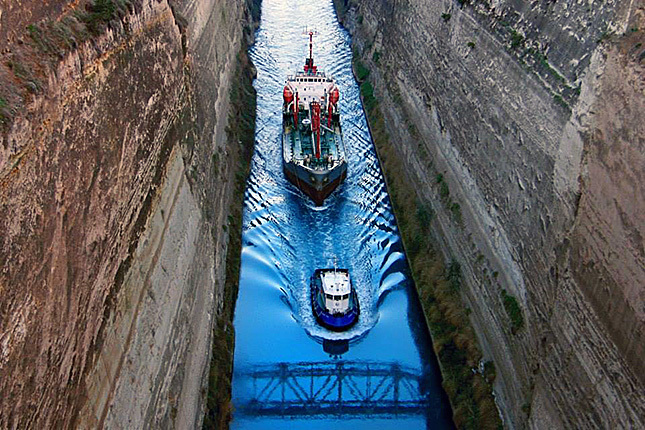 The Corinth Canal, or “the ditch” as the locals sometimes refer to it, connects the Aegean to the Ionian Sea. In ancient times, the diolkós, a stone road, allowed ships to be transferred on wheeled platforms until the 2000-year-old dream of digging the canal was finally realized in 1893. Travel back in time before the opening of the canal and imagine ancient workers pulling their ships over this strip of land. The fortress of the Acrocorinth, which dominates on the summit, leads the way to the ancient ruins of Ancient Corinth, one of antiquity's most significant and cosmopolitan city-states. Interestingly enough, it was also famous for its Temple of Aphrodite, goddess of Beauty and Love, where sacred hetairai once initiated disciples into the “mysteries of love”. The Acrocorinth, acro meaning extreme as it was in every sense, attracted the passions and hatred of both men and women, especially the sailors who stopped off for a night. Stop off at the Corinth Bridge for a photo, enjoy the view of the four-mile-long waterway and catch a glimpse of the bungee jumpers. Visit Ancient Corinth, the ruins of various buildings including the Temple of Apollo, a forum, baths, a basilica and the Agora, the public market, where Saint Paul preached his "words of love" that still inspire us today. Climb to the top of the Acrocorinth, the acropolis of ancient Corinth and home to the Temple to Aphrodite. See the exceptional collection of ancient pottery at The Archaeological Museum of Ancient Corinth. Have lunch with of view from the ancient site. 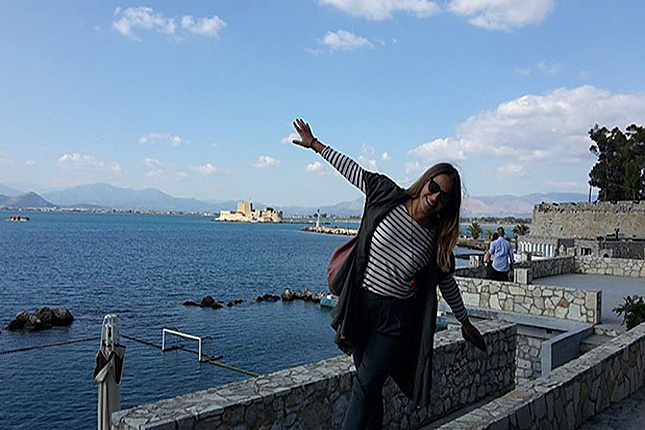 The enchanting town of Nafplio, the first capital of Greece, is graced with a labyrinth of attractions and the castle of Palamidi. Its romantic winding alleyways showcase 15th-century Venetian buildings, some of which belong to the most prestigious families in Greece, historical churches with beautiful frescoes, and the archeological museum. The nearby Ancient Mycenae was once such a great cultural center of ancient Greece that an entire period in history is named after it. It is often referred to as "Golden Mycenae" owing to the wealth of gold that was found there. The Epidauros Theater, the largest and one of the best-preserved ancient theaters in Greece, offers impeccable acoustics. It comes to life every summer with the Festival of Epidaurus, where Classical Greek plays translated into modern Greek are performed and accommodates 14000 viewers. Climb up the 999 steps to the Palamidi Castle and become overwhelmed by the breathtaking view. 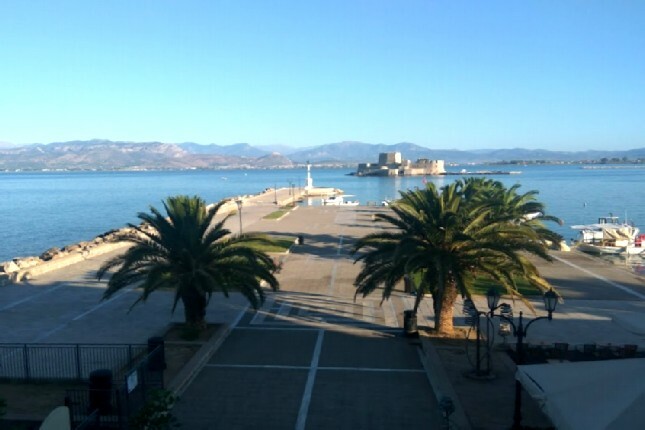 Visit the Archeological Museum of Nafplio which hosts a most striking collection of antiquities. Discover the Kompoloi Museum with the impressive worry beads. Walk through the picturesque alleys of the city center, surrounded by the colorful neo-classical buildings. Shop around the small boutiques carrying everything from clothing and jewelry to arts and, of course, worry beads. Have lunch at one of the restaurants or tavernas inside the historical city center. Walking around the ruins, bring Homer's famous poem the Iliad to life as you admire the Grave Circle in which the golden mask of Agamemnon was found, the Greek protagonist of the Trojan War. Visit the Mycenae Archaeological Museum where more than 2000 objects from Mycenae and its surroundings are exhibited. Continue your tour to the famous vaulted tombs, such as the tomb of Agamemnon and Clytemnestra. Just a breath away is the most magnificent and well-preserved vaulted Mycenaean tomb, "The Treasure of Atreus". Test the outstanding acoustics of the theater by standing at the highest point and throwing a coin to the orchestra! 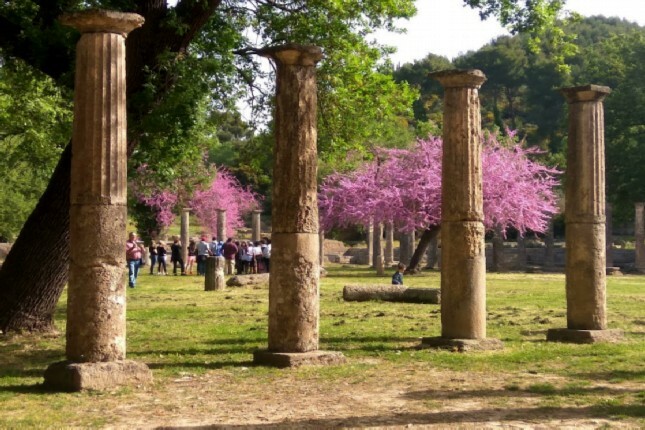 A must see is the nearby Asclepius Healing Centre of Antiquity. 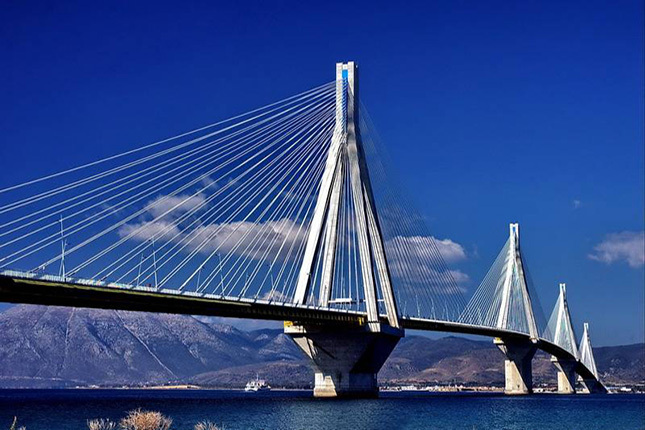 Patras, the largest city in the Peloponnese, is considered the western gate of Greece. Ferries, on a daily basis, connect the mainland to Italy, our western neighbor. It is a lively city full of shops, tavernas and cafés as one of the largest universities in Greece is located here. The city is especially known for its Carnival celebrations when the city breaks out into madness. Saint Andreas Church, the patron saint of Patra, is one of the largest and most artistically significant cathedrals in the Balkans and one of the largest in Europe. Then off to The Achaia Clauss Winery, one of the chief tourist attractions in the region. 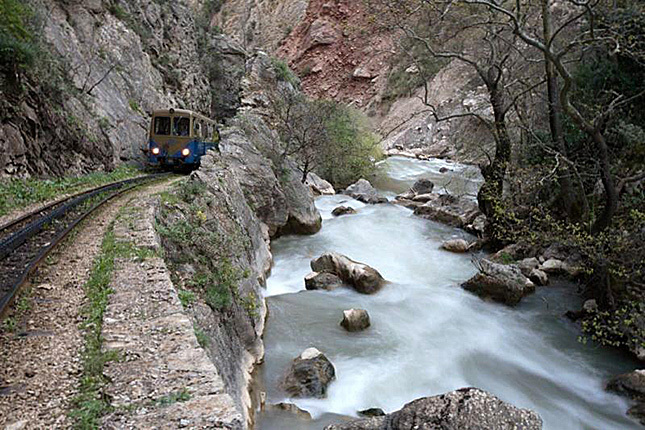 The traditional village of Diakopto is where the rack train starts its climb over the Voutaikos Gorge to Kalavryta, "good waters". Although most famous for its ski resort, the town of Kalavryta has much to offer year-round. Saint Andreas Church, with a 46-metre-high central cupola, has a capacity of 5500 people. Find the well of Saint Andreas next to the old church. This place used to be Demetra's spring and was also used as an oracle for the sick. Legend has it that anyone who drinks from the well will return to Patras. 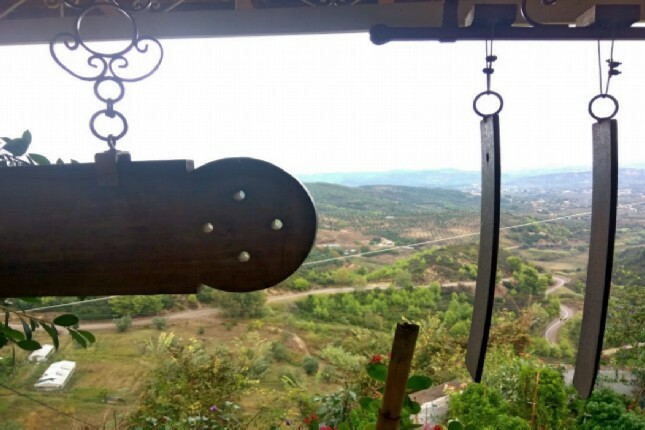 You will stand besotted by the natural beauty of the region and charmed by the breathtaking view of the landscape amidst which the castle-like winery of Achaia Clauss is situated. Try the famous Mavrodaphne, a superb sweet dessert wine reputably named for the black eyes of Clauss’s lost love, Daphne. B sure to take a tour of the old wine cellars with the huge wine barrels carved from oak, especially the one containing the century-old Mavrodaphne wine. The awe-aspiring monastery of Agia Lavra is where the revolution flag of 1821 was raised. Mega Spilaio, the Great Cave Monastery, is located in a stunning landscape at the entrance of a natural cave, since 362 AD. 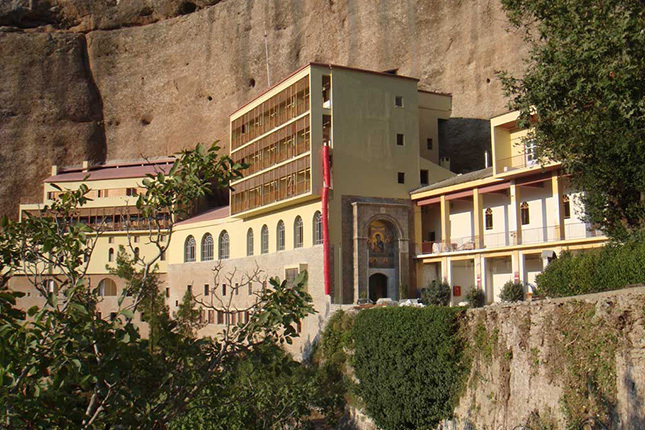 The monasterial compound, the oldest in Greece, consists of eight floors and it is literally hewn into the rock. Katakolon, also known as Katakolo, is a pretty fishing village on the west coast of the Peloponnese, where cruise ships anchor to visit Olympia and its surroundings. Until the end of the 19th century, this harbor was very important for the export of currants. After the currant trade collapsed, the warehouses were converted into souvenir shops. Owing to its geographical position, it is the ideal base to explore the mythical western Peloponnese and countryside. 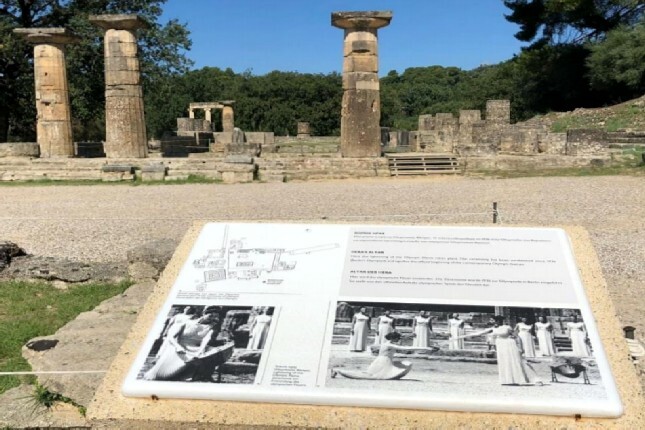 Ancient Olympia, where gods and heroes were said to walk the earth and the land where the Olympic Games, the world’s greatest sporting event, were born! 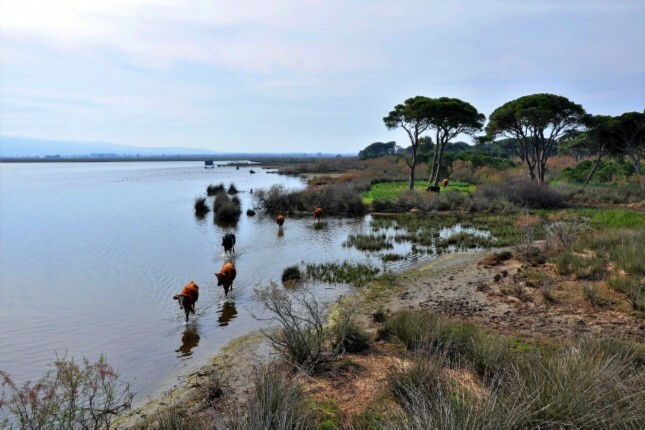 In the heart of the Greek countryside, Olympia is blessed with its fertile land and diverse landscapes. It was once the site of Zeus' most magnificent sanctuaries. His gold and ivory statue, one of the seven wonders of the world, converted the area into the center of interest in the Ancient World. And now, one of the monuments of the world heritage of UNESCO and the only place where the Olympic Flame is lit for each Olympiad. Take a refreshing dip in the Ionian Sea at one of the local beaches. Kremasti Monastery provides insight into the Orthodox religion and wonderful views. 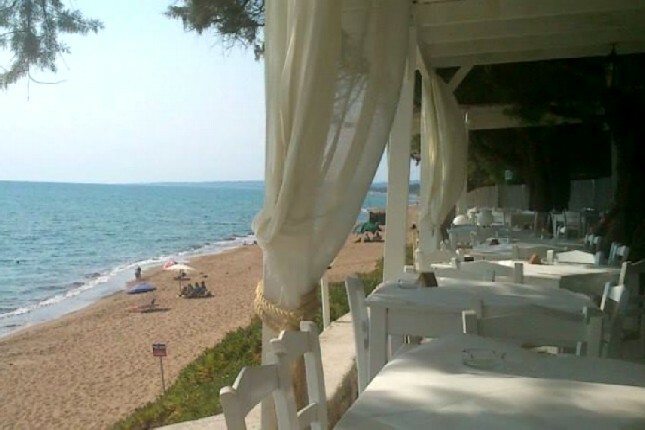 Have lunch at the beach, a local taverna or a family country house. At the archeological site, discover where the Olympic torch is lit. Go through the arched stone passageway to the original Olympic Stadium of the ancient athletes. 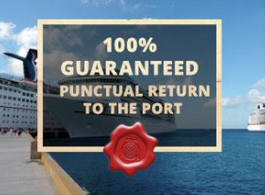 Don't miss the fortunate opportunity to run the ancient track! Visit the Archaeological Museum of Olympia, one of the most important museums in Greece, and experience over 3500 years of history. Visit Archimedes’ Museum of Ancient Greek Technology. Unfold the riddles of the great mathematician, Archimedes, by solving his famous puzzles! Unwind at one of the cafés and tavernas or enjoy shopping at one of the many souvenir and jewelry workshops in the modern village of Olympia. Taste the famous Greek olives and blends of olive oil, the essence of the Mediterranean Diet, and the superb local wines, cultivated in the region for over a millennium. Learn about the rejuvenating properties of the olive oil beauty products, such as soaps, creams and conditioners. Uncover the secrets of honey making and life on a small farm, both in past and present-day Olympia at a local honey farm. 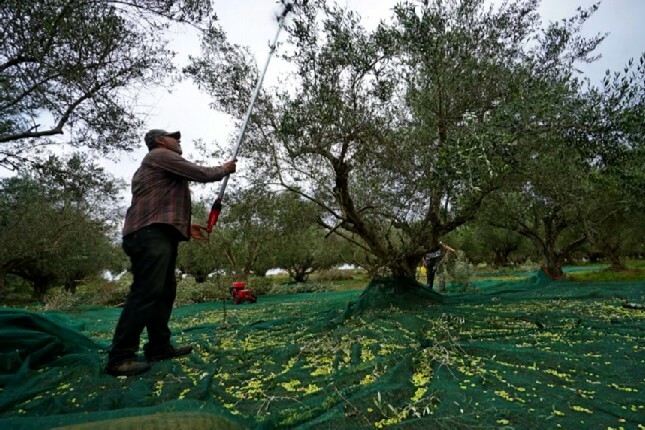 Relish the generous gifts from nature, enjoyed by Greek families in Olympia for thousands of years. The monastery of Sepeto is an 11th century church on a steep rock over the Tritona River with its unique view and architecture. The monastery literally hangs over the narrow gorge of Triton, while the homonymous gushing waterfall flows through the dense forest of wild oaks. Further up (1200m), is the majestic temple dedicated to Apollo Epikourios ("Apollo the helper"). This monument of the world cultural heritage of UNESCO is described as the Parthenon of the Peloponnese. The colorful village of Andritsaina is one of the most traditional and picturesque villages in North Western Peloponnese. "The Lady of Ilia", combines unique architectural beauty and imposing natural landscape. Marvel the architecture and the break taking views at the Monastery of Sepeto. Continue on to the temple of Apollo Epikourios, the god of the sun. Distinguish its uniqueness as it has examples of all three of the classical orders used in ancient Greek architecture: Doric, Ionic, and Corinthian, with a full restoration program. 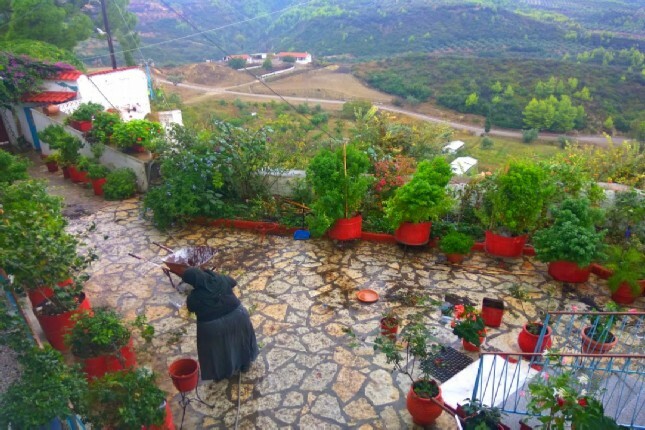 Travel on the road surrounded by lush mountain vegetation which transpires a sense of serenity to find yourself in Andritsaina, a village with a long history, built amphitheatrically on the slopes of mount Lykaion. Admire the beautiful mansions, traditional cafés, traditional tavernas, paved alleys, all to ensure a relaxing and enjoyable stay. 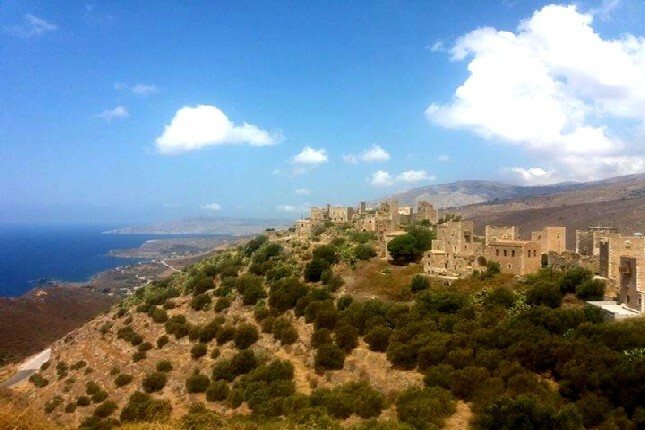 Chlemoutsi is a beautiful medieval castle standing on the summit of a hill on the westernmost headland of the Peloponnese. 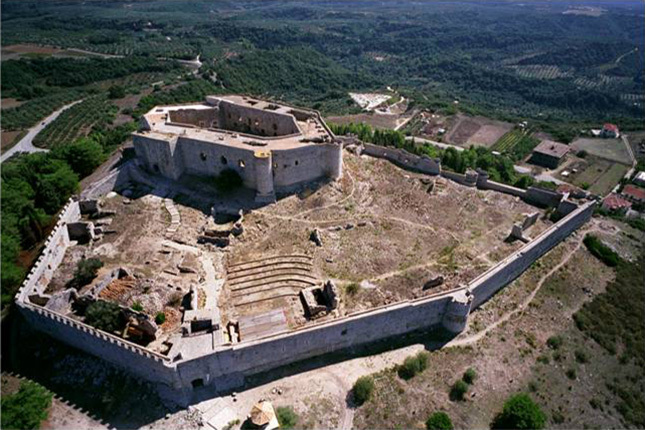 It was built between 1220-1230 and was the strongest fortress in the Frankish principate of Achaia commanding the passage from West to East. It actually converted the area into a crossroad of different civilizations in a period less known to most. The golden sandy beach of Kourouta (near Kyllini) has been awarded with the Blue Flag, a voluntary Eco-label given to clean beaches that are also safe. Enter the core of the castle, where the prince's palace was located. Admire the stone catapult projectiles which were once used to defend the castle. See the huge cisterns for the collection of rainwater under the ground. Explore the princess' bedroom which has now been converted into a beautiful museum. Children will take part in medieval role-play as they live the fairy-tale experience. Stop at the golden sandy beach of Kourouta (near Kyllini) for a refreshing dip. 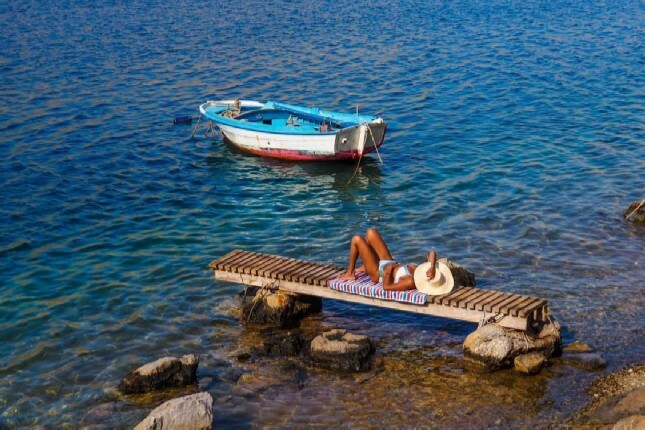 Ideal for families with young children; the waters of Kourouta are shallow and crystal clear. The Peloponnese’s second-largest city, Kalamata, has a special place in the heart of any proud Greek. It was the first town to rise in successful revolt against Turkish rule in 1821. The large central square of Kalamata is a vibrant pedestrian zone full of trendy cafés and commercial shops. The narrow alleys in the Historical Center are full of wonderful neoclassical buildings which now house quaint bistros, traditional tavernas, ouzerie and souvlatzidika. Uphill to the oldest part of town, built on the ancient Fares, and from the medieval castle you can enjoy a wonderful view of the city. 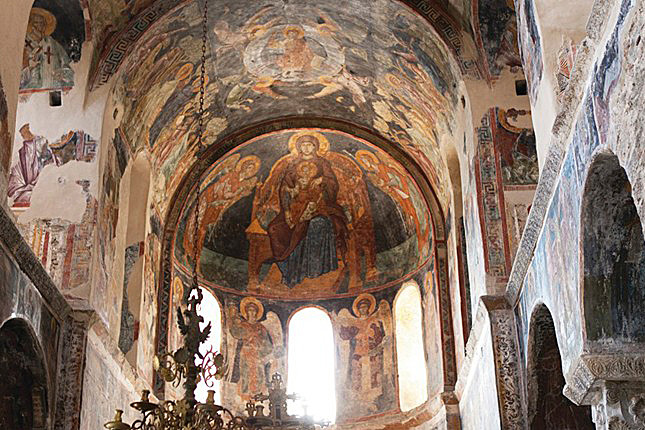 The Monastery of Saint Constantine and Helen is famous for its silk art. Enter the city of Messene through one of the original city gates as ancient travellers did 2300 years ago. The 9km-long city wall is among the best-preserved in Greece. Grasp the opportunity to enjoy a coffee and a traditional sweet in the city and do some shopping. Take the opportunity to taste, and if you want to purchase, some famous local products. Visit to the Byzantine church of the Holy Apostles, built in 1150 AD. There, on March 23, 1821, the Greeks rebelled against the Ottoman Turks and the National Revolution of Independence began. 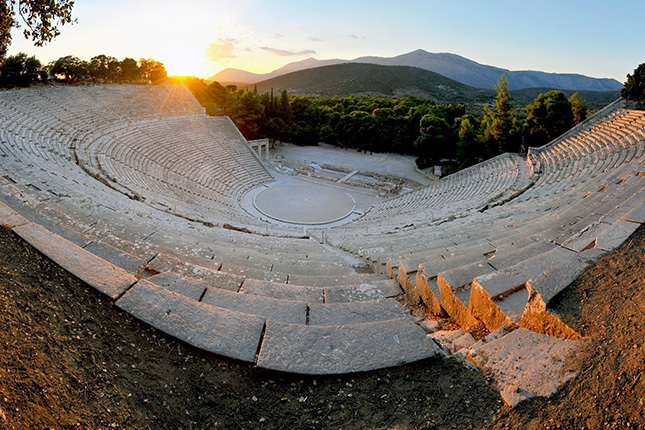 Take your time to admire the Ancient Messenian theatre. After 1700 years of silence, the theatre was reopened last summer with a beautiful opera gala. Discover the town's central shrine and spare a coin for Artemis, the protector of girls. 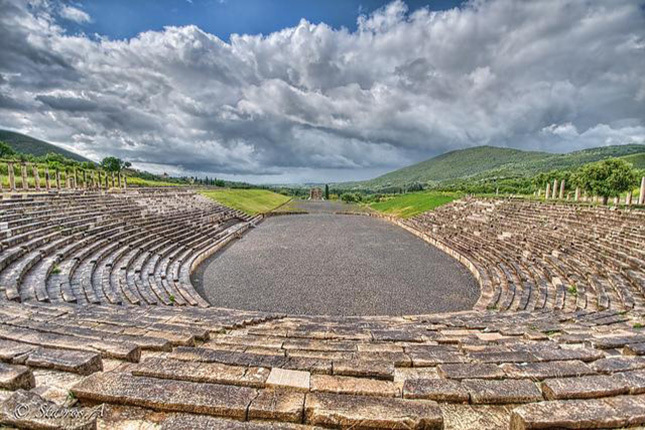 See the very impressive stadium with the breathtaking view over the valley of Messene. Pose on the public Roman toilets while the running water still flows below. See how the young spent their free time carving tic-tac-toe on the steps of the gymnasium. "Do you have an uncle from Koroni?" This is a question you could be asked in Greece if you are a privileged and lucky person with a lot of money, underlining the significance of this small yet important town. In Koroni, the Castle, one of the finest examples of the Venetian fortress architecture is amongst the few which includes houses and churches. 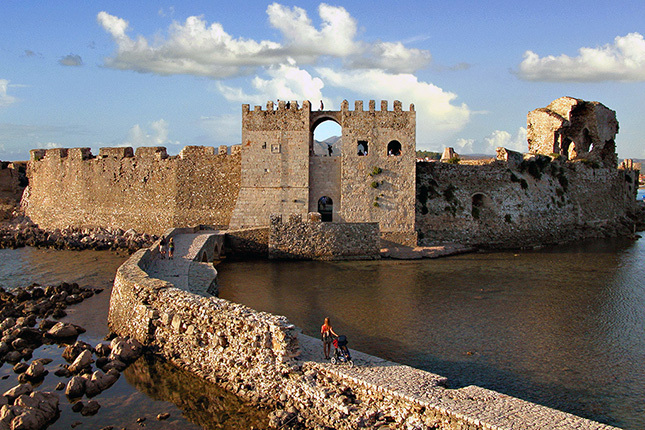 The lovely small town of Methoni has a spectacular castle built at the tip of the peninsula. Here in 1806 Chateaubriand disembarked from a ship starting his adventurous exploration of Greece. Pylos, a small picturesque city in the west end of Messinia, is a shining example of authentic Peloponnesian living. The Niokastro, meaning new fortress, dominates the city and is home to the Centre for Underwater Archaeological Studies. At the south end of the castle the picturesque guard tower annex, Bourtzi, was a prison and place of executions during the Turkish Occupation. It was built in 1500 and connected to the Sea Gate of the castle with a paved tiny road. Jump back to the days of the Ottoman Empire and the "Eyes of Venice" in the Mediterranean. Continue on to the Castle of Methoni. 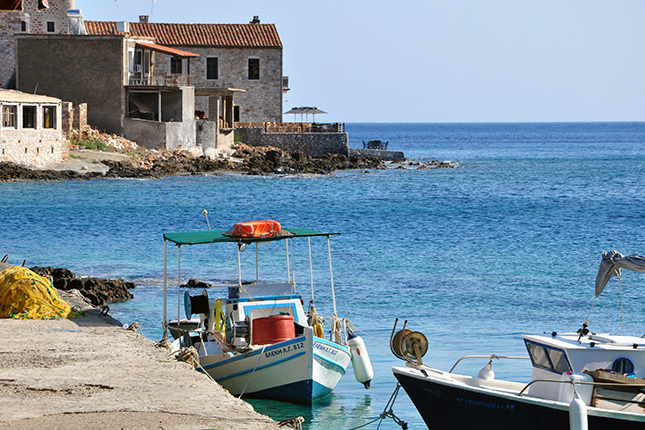 Follow the stone-paved stretch over the small bridge to the small fortified islet of Bourtzi. Complete your medieval exploration in the town of Pylos. The view from its Castle is breathtaking. The ruins of the Byzantine town of Mystras radiate mysticism. For decades, the medieval castle town of Mystras, a major cultural center in ancient times, has confused many as being the ancient city of Sparta. Mount Taygetos towers above naturally protecting Sparta from its enemies with no need of fortification. Little remains from the ancient city of Sparta; the spirit and the bravery of the ancient Spartan warriors, however, are still alive today. Current Sparta is a modern city built in the valley of Eurotas. 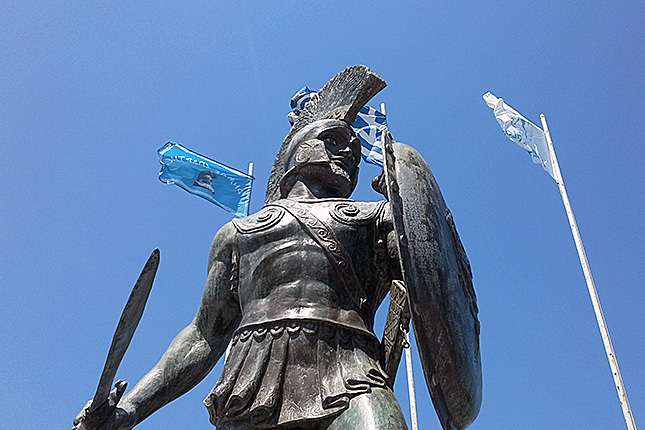 In the most central spot of Sparta is the over life-size statue of General Leonidas, reminding us of the 300! The awarded interactive Museum of the Olive and Greek Olive Oil presents the product, the process and the evolution of the machinery through time. The southern coastline of the Peloponnese was used as the stronghold of many great kings of the ancient world, such as King Menelaos and his beautiful wife Helen, the protagonists of the Trojan War. 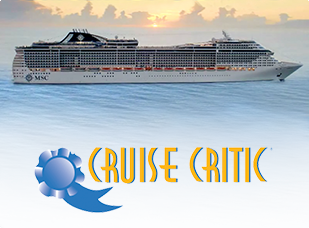 Pass through the plains of Laconia with its lush citrus groves to Sparta. 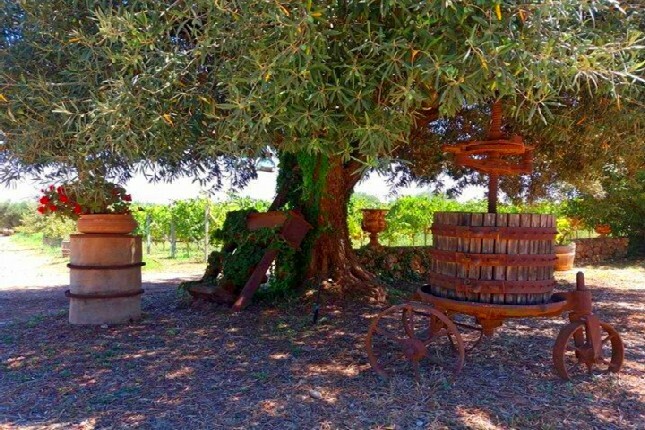 Don't miss visiting the modern Olive and Olive Oil Museum and learn why the olive tree was the sacred tree of the Gods in ancient times. Climb the rocky hill at the foot of Mount Taygetos where the medieval Mystras lies. Admire the frescoes, dated centuries prior to the Italian Renaissance, and see where the last Byzantine emperor of the Paleologos Dynasty was crowned. 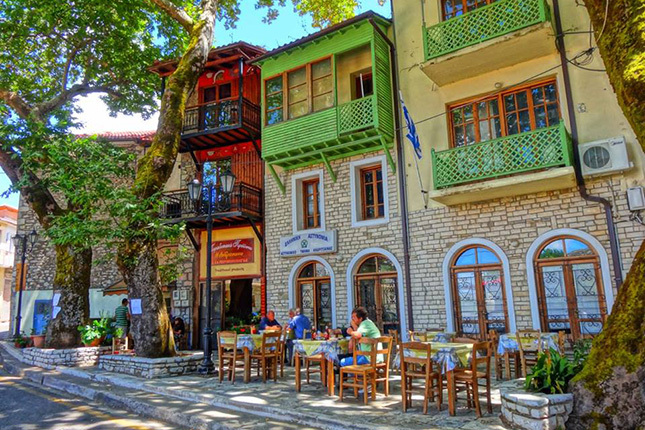 Enjoy lunch by tasting the local cuisine in one of the tavernas in the village of Mystras. Gythion is the most important port in Laconia. Nowadays it is a touristic port, however, in ancient times it was the stronghold of King Menelaos and his beautiful wife Helen of Troy. Through the wild landscape of olive groves and beyond the bare and rocky landscapes are the majestic Diros Caves. Diros offers visitors spectacular beauty hidden in the depths of the earth. This sea cave of exquisite beauty is considered the best of the three most beautiful sea caves in the world. Encircling the intimidating Taygetus Mountains is the Mani. Mani gets its name from the Greek word manis, which means “fury” or “wrath.” The Maniates still boast today of how not one Ottoman set foot on their soil. While historically fierce and proud of it, the Maniates are warm hosts to those visiting their well-preserved villages and unique stone tower houses. 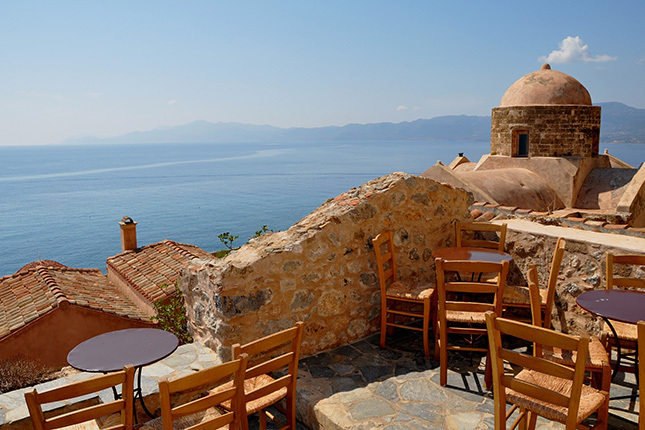 Oitylo is one of the oldest villages, mentioned by Homer, in picturesque Mani. Oitylo has traditional stone houses and a magnificent view of the gulf. 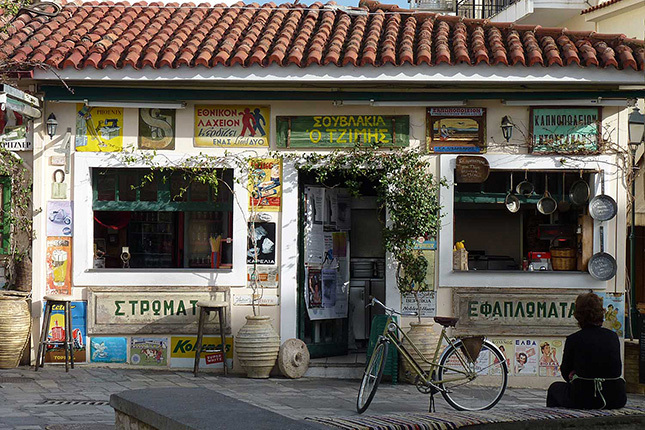 Finally, Areopolis offers tavernas, traditional coffee houses and shops selling souvenirs and local products in an old-world way. Spend some time at Gythion Port; admire the fishermen on their colorful wooden fishing boats and the locals and their families walking along the promenade in the summer months. 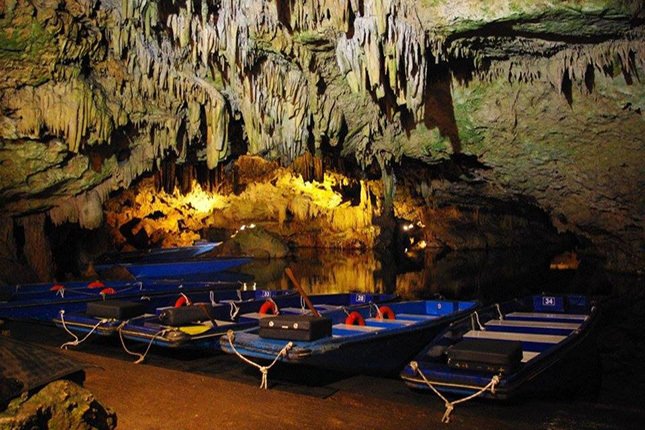 A visit to the Diros Caves lasts 40 minutes. Don't forget to wear comfortable shoes! 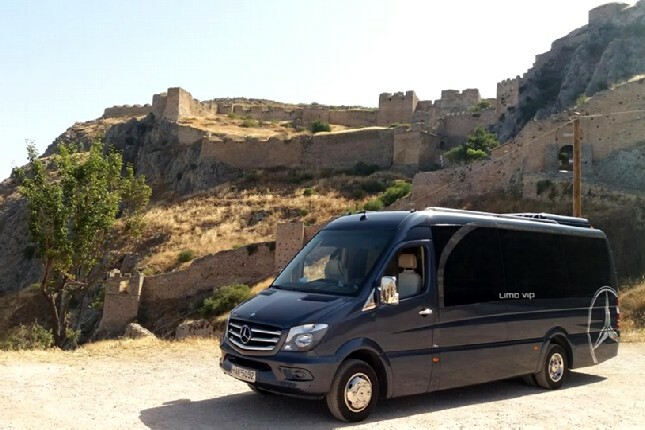 Drive through Mani, the place which was never conquered by the Ottoman Turks, renowned for its imposing medieval family fortresses. 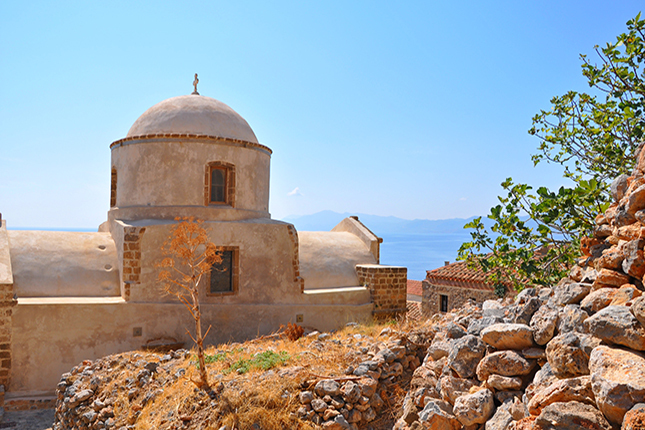 Discover the lesser-known part of the Peloponnese as you village-hop from one hidden treasure to the next. Take a dip in the crystal-clear waters of the Laconian Gulf. Tingle your taste buds with a taste of the local cuisine as your senses explode from the fragrance of wild herbs. Do your last souvenir shopping on your final stop in Aeropolis. 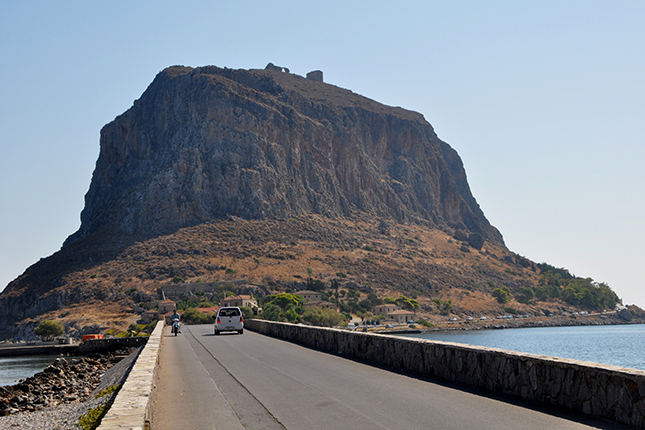 Monemvasia is literally built on the slopes of a huge rock that stands into the sea. The Venetians used to call it the Gibraltar of the East. Monemvasia is located in the southeastern Peloponnese in the prefecture of Laconia, 400 meters from land having been separated from the mainland by an earthquake in 375 A.D. Its name derives from two Greek words, mone and emvassi, meaning "single entrance". A huge wooden gate leads you to the hidden gem within the medieval walls of the fortress. Castles, walls, old mansions, winding cobblestoned paths, churches, low arches and vaults, coats of arms, imperial marble thrones, Byzantine icons all give the town a distinctive medieval feel untouched by time. Many old mansions in Monemvasia Old Town have been turned into boutique hotels, restaurants and shops where you can enjoy a day of shopping and taste some of the fine local products. 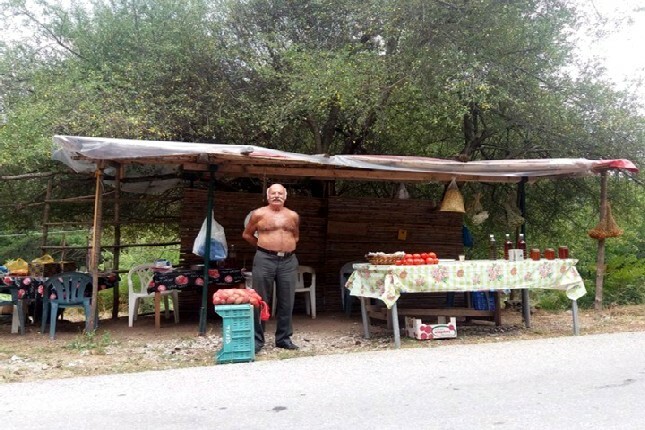 Travelling through the Peloponnese is a unique way of understanding everyday life in the Greek country. Stretching its fingers into the Mediterranean, it transports its visitors to another time through its rich history and folklore. The Peloponnese offers a unique scenery of picturesque landscapes, featuring a glorious past and interesting present. 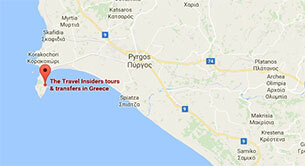 Tours throughout one of the most beautiful places in Greece are the perfect choice for an authentic experience. So, decide on the areas that you would like to visit and set off to discover real Greece in the Peloponnese!